Last week I bought some bright pink nail polish at the store on a grocery run-how easily I wander off task! But when I saw that the 60 sec fast dry nail polish was 50% off, I added it to the list. So I took my nail polish home and put it in my bathroom where it had the potential to sit a very long time. A few nights later, I was getting Aislynn out of the bath when she noticed the nail polish, "Pink!" she exclaimed. I smiled to hear my little girl's enthusiasm and appreciation for a truly wonderful color. "Yes," I said, "It for painting nails." To which she responded, "Aislynn pink nail?" "Do you want Mommy to paint your nails pink?" "OK." She said, as if it was my idea and she was going along with it. She is sneaky that way. She held out her little hand and I slowly painted one nail. Since this was her first beautifying experience with nail polish, I thought I had better stick to just one, in case she changed her mind half way through and I was without nail polish remover. Although I had purchased the "60 second" super fast drying polish, this was the first testing of this claim. The nail looked very pink to Aislynn's delight. "One pink nail!" she shouted, holding up her finger triumphantly. She bolted from the bathroom and showed Daddy and Isla her pink nail as well as herself this wonderful sight in a free standing mirror. Throughout the rest of the week she had many opportunities to happily show people her pink nail. I am sure people halfway wondered why she only had one nail painted. Or maybe they just thought she got a hold of the polish-I will admit the paint job was not my finest. After one full week with just "one pink nail" I decided Aislynn might be ready for the full set. After she showed me her pink nail while drying off from a bath, I asked her if she wanted me to paint more nails. "Ok!" she exclaimed. We sat on the rug in the bathroom and she patiently stretched out her little hands as I attempted to paint just her nail and not her whole finger! As I painted each nail, she pointed to the next and said, "And this one" just in case I happened to skip over it like I did the other nine last time! Once they were all painted I blew on them to try to help them dry faster. To my amazement, Aislynn did not try to touch them or scrape off the polish. She held her hands still and then up in the air and declared, "Oh that's nice!" Then she bolted from the bathroom ready to go on her "nail show-and-tell tour" throughout the house. For me, this was about more than pink nails. 5 months ago this could not and would not have happened. If I had tried to paint Aislynn's nail she would have not been happy about it. She would not have sat still at all. If I had tried to explain it to her, she would not, or could not have understood it. If I had tried to just dialogue with her about this seemingly random and unimportant event, there would have been little said or understood. This experience is just another reminder to me how normal things are now and how far we have come. 4 months ago I half wondered if I would ever be able to have a real conversation about anything with my little girl. Today I sat on the bathroom floor and painted my little girl's nails upon her request. Today I feel grateful for where we are and how far we have come. I feel grateful that I can ask my little girl a question and she can understand it and respond. 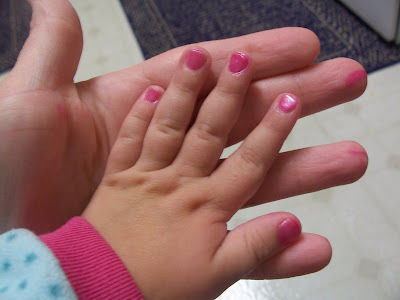 I feel grateful that my little girl wants me to paint her nails. I feel grateful that tonight, she walked over to the pantry like it was nothing, pointed up to the shelf and said "Peanuts please."